Is Vinegar OK for Pregnant Women? Eating while you're pregnant can be fraught with worry and fear, since certain foods are off-limits, and many more foods exist somewhere in the gray area between danger and complete safety. Rest assured that vinegar is safe to consume during pregnancy. Plus, you'll also find it useful for cleaning chores, because you'll want to limit your exposure to commercial cleaning products. Vinegar doesn't appear on the American Pregnancy Association's list of foods to avoid. A splash of vinegar on a salad or a recipe that includes vinegar are safe ways to consume the product and won't put your pregnancy in jeopardy. In fact, many women drink a vinegar potion to help alleviate morning sickness, according to Stacey Rosenberg, author of "Natural Pregnancy, Natural Baby." These women soak organic bones -- cooked, of course -- in apple cider vinegar, which releases calcium into the liquid. A small amount of the resulting solution might help ease morning sickness, as well as supply your unborn baby with an extra dose of calcium. Keep in mind that many foods that might contain vinegar are off-limits during pregnancy. 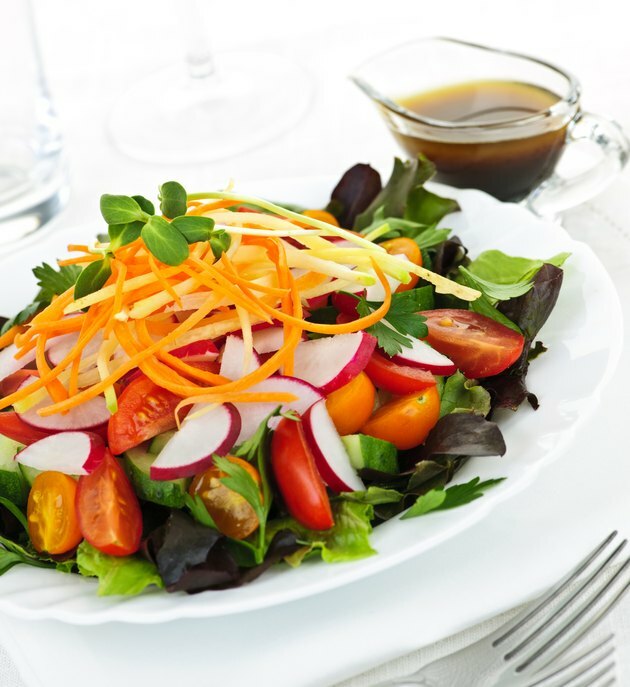 The APA cautions against eating unwashed vegetables; don't use vinegar to dress fresh greens that haven't been washed. While the vinegar itself doesn't pose any danger, the unwashed vegetables can be contaminated with toxoplasma gondii, a parasite that can cause toxoplasmosis. Toxoplasmosis can cause premature delivery and low birth weight as well as more severe conditions such as seizures in infants and mental retardation, according to the APA. Don't eat raw or undercooked fish or shellfish, such as oysters, with vinegar sauces either. Again, the vinegar isn't dangerous, but undercooked or raw seafood might cause problems. Though safe, vinegar's acidic, which means it could potentially cause heartburn, according to Marguerite Patten, O.B.E., and Jeannette Ewin, Ph.D., authors of "The Healthy Gut Cookbook." Heartburn is likely during pregnancy, because the increased amount of progesterone in your body causes the valve that prevents stomach acids from coming up your esophagus to relax, which raises the risk of heartburn, according to the APA. Avoiding acidic foods is one way to reduce the chances that you'll develop this uncomfortable condition. If you do eat vinegar and experience heartburn, try having a glass or milk or a serving of yogurt, both of which can ease the burning sensation, the APA says. Though most commercial cleaners are safe for use during pregnancy, that only applies if you're cleaning in a well-ventilated area where you won't be inhaling strong fumes and if you wear protective gloves, the APA notes. Vinegar is a natural cleaning product and can keep your mirrors, windows and floors sanitary and sparkling. Put white vinegar in a spray bottle and use it to wipe down your mirrors and windows. Or combine white vinegar with hot water and use the mixture to mop your floors. If you're worried about commercial cleaning supplies, talk to your doctor to ease your fears or switch to vinegar until you deliver. The Healthy Gut Cookbook; Marguerite Patten, O.B.E. and Jeannette Ewin, Ph.D.